Over the last year, Lyric Arts has proven taking risks doesn’t scare them. These risks have included taking on their biggest production to date in Young Frankenstein. And staging productions for two shows some would view as controversial for a community theatre, RENT and The Laramie Project. So it should come as no surprise that Lyric Arts is taking another risk with their newest production, A Christmas Carol. Instead of presenting the Dickens’ classic as many have come to know they have instead produced a Steam punk version of the holiday classic. I have heard of Steam punk, but I’ll admit I had to rely on Google to explain exactly what it was. If you’re not familiar with Steam punk it is a science fiction sub-genre usually set in the Victorian Era. It plays up the industrial and invention side of this time period. Especially with the advances in steam technology. When I first heard this was the direction Director Daniel Ellis and his creative team had chosen for this production, I thought it was bit odd. But after seeing the show, I realized the brilliance in this choice. Lyric Arts wants to differentiate themselves from the production of A Christmas Carol performed at the Guthrie for the last 40 years. Plus, they are continuing to carve their identity as a destination for exceptional theatre in the suburbs. Scenic Designer Sadie Ward had the task of designing a set that could easily serve as several locations and easily found the solution. The intricate design in the staircase and Scrooge’s office is gorgeous. The period costumes designed by Stephanie Mueller are beautiful. The attention to detail to make sure every piece is accurate to the style of the period is immaculate. Personally, I loved the props used by the Spirit of Christmas Past and the Spirit of Christmas Future as well as the Watchworks vendor. Nate Otto did an incredible job creating the watchworks vendor’s cart complete with working valves and steam production which was a great effect when seen from the audience. Also, the wind up key on the Spirit of Christmas Past that completes the character as a vintage wind up doll is a great use of technology. 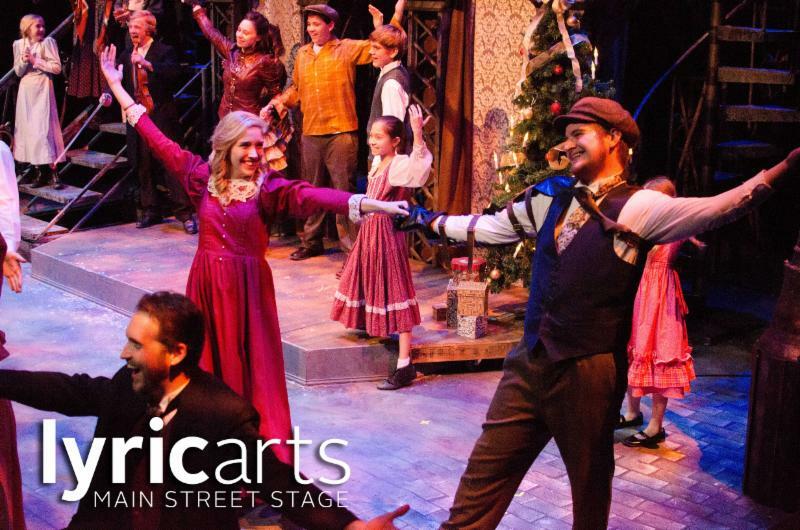 A Christmas Carol – A Ghost Story of Christmas runs at Lyric Arts through December 21. This show is the perfect addition to your family’s holiday traditions. For more information on the show, visit Lyric Art’s site.